The Kanaka Durga Temple on Indrakeeladri hill was filled with a sea of devotees on the third & final day of Sakambari Festival yesterday. Hundreds of devotees have thronged to the temple to seek blessings of Goddess Kanaka Durga in Sakambari Devi avatar. 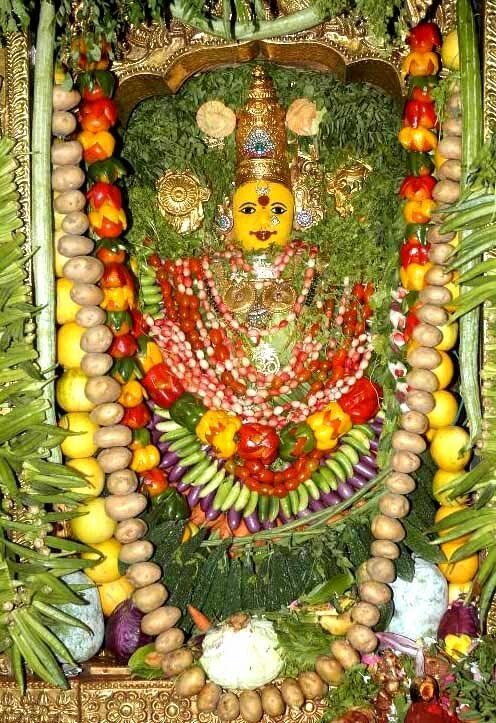 The temple looked attractive with the decoration of fruits & vegetables worth rupees 1 lakh. The rush in the temple has started at around 5 AM in the morning and continued till 9 PM in the night. Friday being Guru Purnima coupled with the final day of Sakambari festival led to a huge number of devotees visiting the temple. The ghat road leading to the temple has been jam packed with vehicles. Even the VIP & break darshan queues were seen extended till the shops located outside the temple premises. The festival came to end after the Purnahuti in the temple on the final day. Tight security has been deployed at the temple in view of the Mumbai Terror attacks & also due to the huge number of devotees visiting the temple. Police have been stationed from the toll gate till the temple premises as additional cover. Earlier in the day, a bomb squad has checked the temple & its premises to make foolproof security arrangements in the temple.